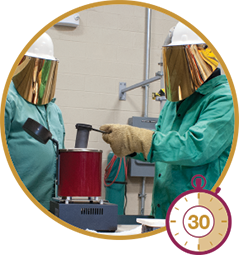 Initiated by members of the Corps of Cadets' 1964 M Company, the Alumni Association's Hokie Gold Legacy Program collects alumni-donated class rings, which are melted down at a campus foundry to become part of new class rings for today's Hokies. Virginia Tech class rings are forged in flame and memory, bonding alumni to the university and their graduating class. 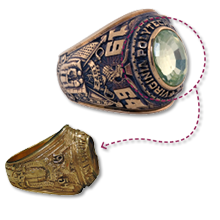 Rings in the Alumni Association's Hokie Gold Legacy Program, however, are even richer in history. 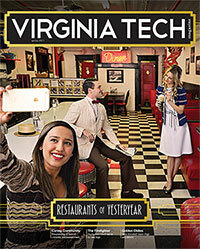 Decades-old rings are liquefied at temperatures reaching nearly 2,000 degrees and then blended into new rings, creating a molten connection between today's students and Hokies from decades ago. Beginning with the Class of 2014, alumni who have ordered gold class rings wear Hokie gold, a sliver of history on their fingers. Melts take place, typically in the fall, at the Kroehling Advanced Materials Foundry, home to VT-FIRE (Virginia Tech Foundry Institute for Research and Education). 2) Jewels are removed from the older rings. 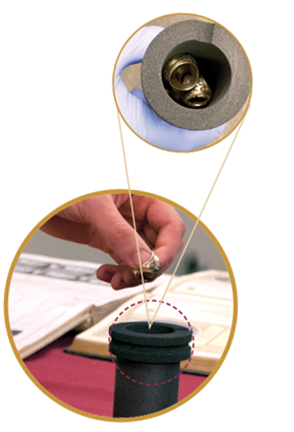 3) A crucible made of graphite carbon is heated to 400 degrees to remove any moisture, and then the rings are placed inside. 4) The crucible is inserted into a small resistance furnace, which passes an electric current into a heating element made of tungsten. The element heats the air, which in turn heats the crucible and melts the gold. The resistance furnace takes about 30 minutes to fully melt the gold. 5) Clad in steel-toed boots, flame-retardant wool or cotton underclothes, a helmet with a face shield, and leggings and a coat that are both aluminized (meaning that layers of metal are incorporated into the fabric), a student removes the crucible. 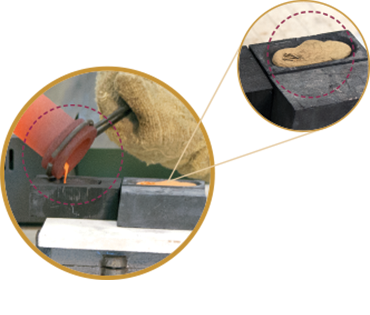 6) The student pours the molten gold into an ingot, forming a molded shape that will be re-melted at a later date. 7) The ingot of gold is then sent to Balfour, the company that makes Hokie rings, for refining and inclusion in future class rings. Balfour refines the gold into small pellets the size of a BB. 8) Each pellet of Hokie gold is combined with standard gold and placed in the cast of a "tree" that holds as many as 20 rings. The leftover parts of the tree are re-melted and reused for future rings.